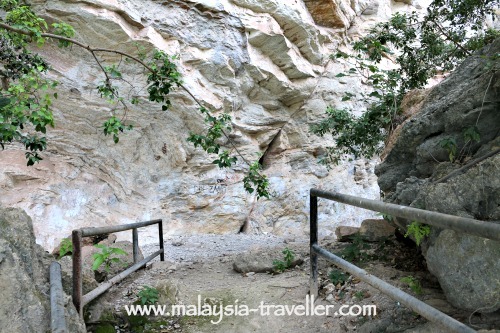 Considering Gua Tambun Cave Paintings have been around for thousands of years they are not that well known due to poor promotion (they are not even mentioned on the official Tourism Malaysia website for example). They were ‘discovered’ in 1959 by Lt. RL Rawlings, a British army officer with the 2nd Battalion of the 6th QEO Gurkha Rifles while on a routine training exercise. 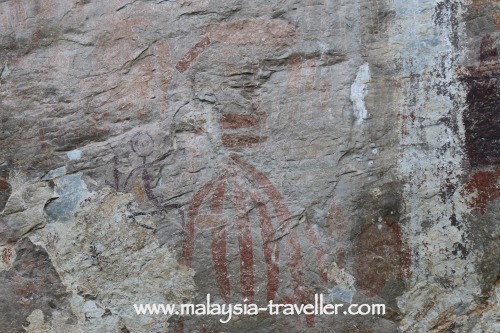 He would have realised that these reddish-orange drawings were not the usual graffiti and this was confirmed shortly thereafter by a team from the National Museum who identified the doodles as Neolithic rock art. Their exact age is rather fuzzy with most estimates putting them between 2,000 to 5,000 years old. They’re certainly very old! 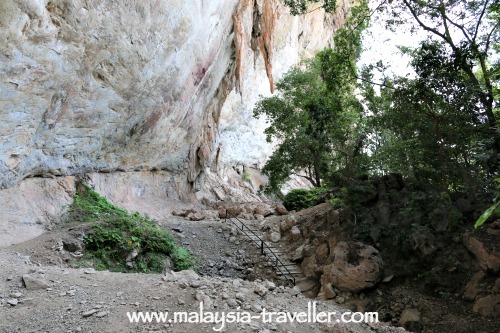 They have been painted on the side of a limestone cliff ~ they are not really in a cave at all but on a rock shelter, a slightly overhanging ledge, located between 5 and 25 metres above the ground level. They were most likely painted using haematite. 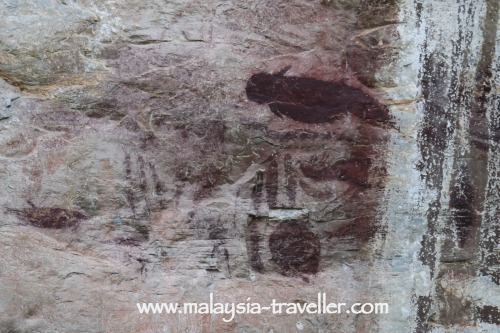 Given their age and the fact that they are exposed to the elements, it is not surprising that large parts of the rock art have faded and can no longer be seen by the naked eye. Vandalism and graffiti have encroached on some of the lower level rock art. 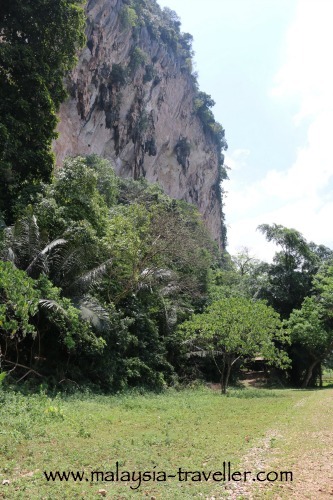 In 2009, a team of researchers from University Sains Malaysia, using close range high resolution photography and digital image analysis conducted a thorough examination of the site and were able to identify that there were once over 600 distinct rock art elements, possibly making Gua Tambun the largest rock art site in Malaysia. Most casual observers would be lucky to identify more than a few dozen or so drawings now remaining. The drawings are of humans, animals, fruit, geometric shapes and abstract motifs. 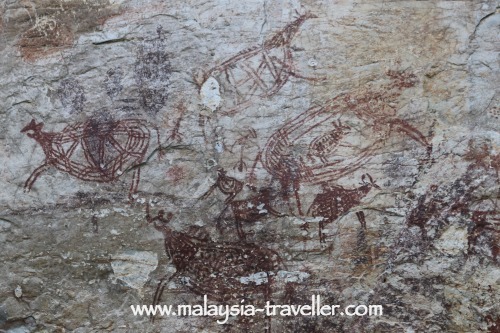 A dugong, a tapir, boar, deer, goat, turtles are among the recognisable creatures. Scroll down to the bottom of this page to see the map. As shown on the map, the landmark to look for in Ipoh is the Caltex petrol station on Jalan Tambun (A13), close to where Jalan Tambun passes underneath the Lebuhraya Utara - Selatan (North South Expressway). There is a short lane next to the petrol station which leads down to the gated entrance to a polo field. Park here (next to the no parking signs!) 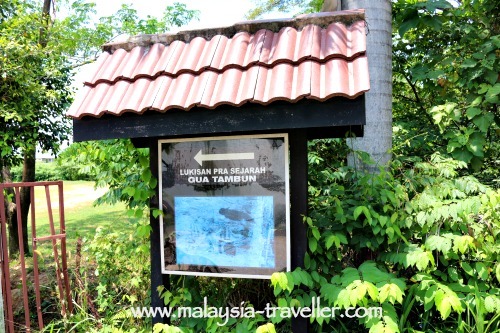 or somewhere nearby and continue on foot.-Squeeze past the gated entrance (it feels like you are trespassing but there is a sign here pointing to Lukisan Pra Sejarah (Prehistoric Paintings). Follow the track at the edge of the polo field along the foot of the hill. 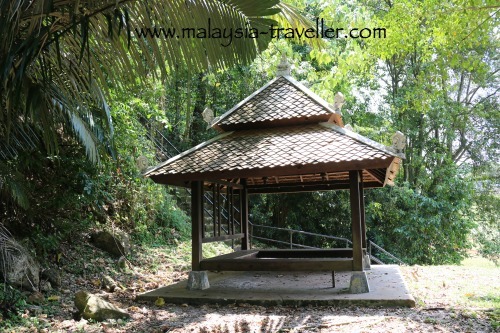 Soon (after 500 m) you will see a wooden gazebo with a flight of concrete steps going up the hill. 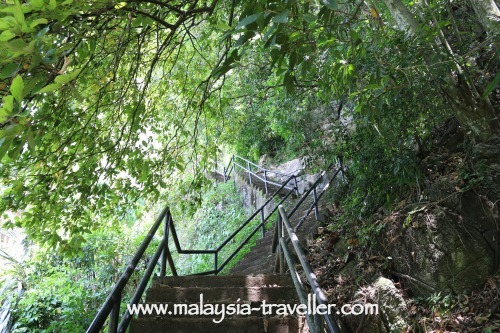 Once you reach the top of the steps the rock paintings can be found on the cliff face in front of you, off to the right. 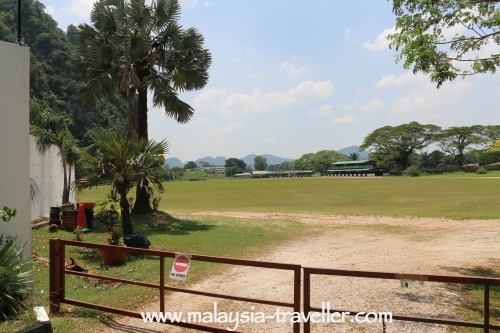 Looking for somewhere to stay in Ipoh? Take a Look at Agoda’s website for a wide range of hotels at discounted rates.